Rambling Rose is a traditional gypsy ‘Bow Top’ caravan where you can escape the stresses and strains of modern living with a relaxing and unusual holiday. If you've ever dreamt of a more simple life, living off the land, but with a dash of glamour tinged with the romance of life on the road, then Rambling Rose Caravan could be just the place for you! Rambling Rose, a traditional 'bow top' gypsy caravan, has been lovingly restored and contains a mix of beautiful authentic features as well as modern touches. So as well as the wood-burning stove, pull-out bed, colourful curtains and freshly painted woodwork, you'll also find original paraffin lamps and power to add a little touch of luxury. It's all slightly eccentric, and the stunning views and location only add to the overall experience, which we think will be a wonderful holiday experience for a couple, or couple with a small child. 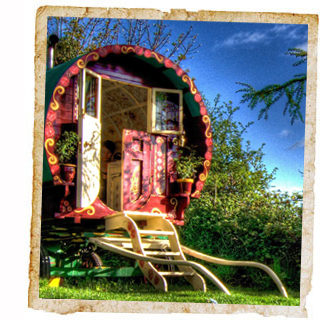 The gypsy caravan is situated in a secluded corner of Delancey House garden, with the most beautiful views all around. Not only is Delancey House a peaceful, relaxing and inspiring place to just hang out, it’s also a quick walk downhill to the nearby town of Lostwithiel and a short drive to a multitude of beaches, as well as major attractions such as the Eden Project and Lost Gardens of Heligan. We can also offer local courses in wild food foraging, cookery and ‘bush tucker survival’! Susy ~ Absolutely amazing stay. The location was stunning, our hosts were welcoming, friendly but not obtrusive. The welcome hamper of necessities was a lovely touch. We spent 5 nights in the caravan and left feeling really blue that our stay was over. Cooking over a campfire was amazingly good fun but you are within easy reach of several pubs and eateries. Can't recommend Rambling Rose highly enough, if you're looking for a romantic, secluded break surrounded by beautiful countryside then this is the place for you! Jodie ~ We had a lovely time. The caravan is beautifully decorated, immaculately restored, cosy (even on cold nights!) and had everything we needed. The view from the caravan is stunning with a beautiful outside space.